1. Wash the kale in cold water, and thoroughly dry each piece by gently squeezing a paper towel throughout the folds. Tear or cut the leaves from the stems; tear or cut again into bite-sized pieces and gently squeeze with paper towels. Place torn leaves between paper towels to further absorb moisture; set aside to air dry while making the vinaigrette. 2. After tossing the kale pieces in the vinaigrette, use paper towels to mop off the excess dressing before placing them on the baking sheet. The vinaigrette makes it more challenging to get an extremely crispy chip, but the flavor is 100% improved over plain chips. a. A conventional oven should be just hot enough (400 degrees F) to roast the pieces without burning them. Swish the chips around with tongs about half way through baking, and check them toward the end of the baking time to see if most are crispy sounding when you move them with tongs. They are done at this point. b. Some recipes call for 325 degrees F for 20 - 22 minutes for toasted chips. You might have to experiment with your oven to get the best results. 1. Place the kale pieces in a large bowl. 2. In another bowl, make the vinaigrette. Combine the vinegar, mustard, shallot and garlic. Whisk in the olive oil until the dressing has emulsified. 3. Pour half of the the dressing over the kale, and massage it throughout the leaves with your hands. The leaves should be just coated, but not soaked; add more dressing if needed (depends on the size of the bunch of kale). If the leaves get too wet, pat off the excess dressing with paper towels. Add salt and pepper and mix with your hands. Taste for seasonings. 4. Put one layer of kale on each baking sheet. 5. Place the pans in the preheated oven. In a conventional oven, stir and flip the chips with tongs 1/2 way through cooking, about 4-6 minutes. Continue baking for 4 - 6 minutes (10 - 12 total), until you hear the crunch of the crispy edges when moved with tongs; do not overcook. 6. Transfer to a bowl and serve. 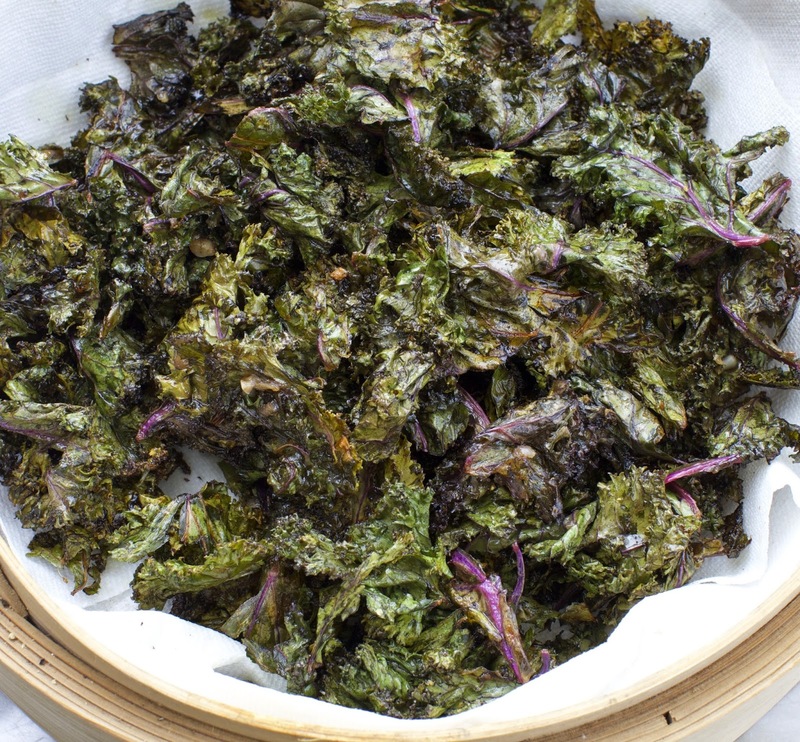 Most of the kale pieces will get crispy, but not all. They tend to get softer as they cool (if there are any left), but will still taste good. 7. If you didn’t use all the kale, put another batch in the pan(s) and repeat Steps 5 and 6. *For a great flavor punch, I like Wine Country Kitchen’s Pomegranate White Balsamic Vinegar found online or at Mill Valley Market.